Have you checked the fashion design by Herrera? It is elegant and stylish. It is not fussy. Do you know the birth name of Herrera? She was born on 8 January 1939 in Caracas, Venezuela as María Carolina Josefina Pacanins y Niño. Her mother is María Cristina Niño Passios. Her father is Guillermo Pacanins Acevedo. He was the former governor of Caracas who previously worked as an air force officer. Herrera saw the world of fashion because of her socialite grandmother. She took her to Balenciaga shows which wowed her. Her grandmother also bought Dior and Lanvin outfits for the young Herrera. Guillermo Behrens Tello and Carolina Herrera married in 1957. Her husband was a Venezuelan landowner. She was 18 years old when she married him. Both had two daughters. Both were Mercedes and Ana Luisa. However, the couple divorced. Herrera married Reinaldo Herrera Guevara in Caracas in 1968. In 1962, Guevara earned The 5th Marqués of Torre Casa title after the death of his father. Facts about Carolina Herrera 7: who was Reinaldo? The father of Reinaldo was Reinaldo Herrera Uslar. His father owned Venezuelan sugarcane plantation. He was also an art collector. Reinaldo was the host for the morning TV news in Venezuela. Due to her marriage with Reinaldo, Carolina got the title as The Marquise consort of Torre Casa. Since Reinaldo had no son, the title was retracted in 1992. Check Amanda Wakeley facts here. People recognize Herrera with her dramatic style. In 1972, she was on the International Best Dressed List. She debuted her fashion line at Manhattan’s Metropolitan Club. The future supermodel Iman was included in the first runway show of Herrera in 1980. Get facts about Calvin Klein here. 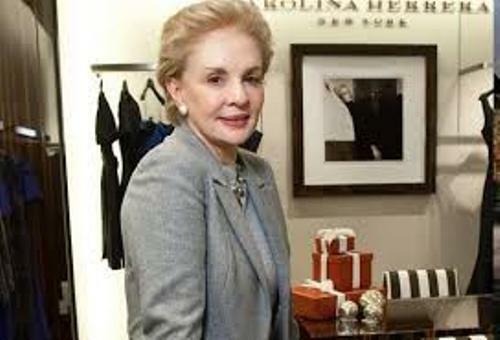 Do you enjoy reading facts about Carolina Herrera?